Since 2004, Steve has helped clients make good decisions about their finances, so they can pursue and enjoy what is most important to them. He is dedicated to providing personalized, professional investment and financial planning advice. Before joining Grand Wealth Management in 2015, Steve was a financial advisor and partner at Savant Capital in the Washington, DC area. He has been quoted in numerous national publications including The Wall Street Journal, Barron’s, Forbes, Morningstar, USA Today, Time, and Consumer Reports. 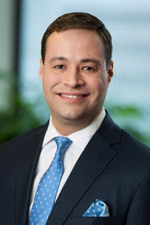 Steve also has been recognized for his contributions to the financial services industry by InvestmentNews (“40 Under 40,” 2015), the Financial Planning Association of the National Capital Area (“Financial Planner of the Year,” 2012), and the Washingtonian (“Top Advisor,” 2014). Steve is a violinist, and avid supporter of the arts and arts education. He serves on the development committee for the Grand Rapids Symphony. Steve also serves on the board of Rethinking Dementia: Accelerating Change, is a member of Grand Rapids Rotary, and is a member of the 2017 class of Leadership Grand Rapids. WZZM 13 – Does the new tax law affect charitable giving? Journal of Financial Planning – Is Your Firm Prepared for Alzheimer’s?